Since 1869, Sainsbury’s has been a pillar of the great British high street. Over 148 years, they have established a reputation as a leading retailer that looks after and out for their colleagues and customers. That’s why their proposals to force unscrupulous contract changes upon their staff are so appalling. And for those staff who refuse to sign these new contracts? They will be forced to resign. Against all Sainsbury’s values, they are forcing thousands of dedicated staff to ‘work well for less’. And as a Labour Party, we have a duty to ensure that their voices are heard. Take Jayne, a night shift worker at Sainsbury’s for over 30 years, set to lose £2,000 per year. She loves her job and desperately wants to stay but does not think she can afford to do so. She describes morale in her store as ‘at rock bottom’ and tells me that she is beyond frustrated that her decades of loyal service appear to count for nothing. But Jayne is one of dozens of negatively affected staff who have written to me from across the country. And so I have met, twice, with senior Sainsbury’s staff in Parliament to raise their concerns. It was the language used in these meetings by Simon Roberts, Retail and Operations Director, that shocked me most. After confirming that thousands of staff will lose out under their proposals, Mr Roberts described those losing the highest figures as ‘anomalies’. But I don’t see them as anomalies. I see them as longstanding, loyal staff who have dedicated decades of their lives to the organisation. Besides, it is disingenuous of him to try to skew the figures by discounting those who are most negatively impacted by these changes. I can only imagine how infuriated these 9,000 staff must have felt when watching Sainsbury’s CEO Mike Coupe singing ‘We’re in the Money’ on ITV News. 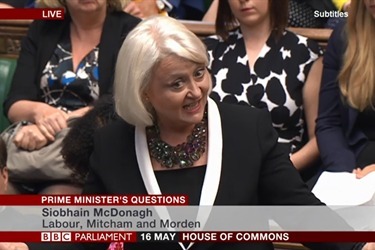 And so, earlier this month, I sang my own version of the song at Prime Minister’s Questions, after which the Prime Minister promised to look at the issue. I followed this up with a letter to her signed by 114 MPs and currently await a response. Since then I have called upon the Business, Energy and Industrial Strategy Committee in Parliament to summon Mr Coupe to justify how he can rob Peter to save Paul under these proposals. How can a company that made a pre-tax profit of £589m last year, with a CEO that receives £930,000 before bonuses, think it is right to force a pay cut on their most longstanding members of staff? Of course, this is just the latest setback for workers’ rights in this country. Almost a year has now passed since the Taylor Report, with over 1 million workers still trapped in a workers’-rights-lacking gig economy. The number of zero hours contracts has grown by over 600% since 2008. And real wages will have been in decline for 17 years by the time they are expected to return in 2025 to their pre-crash level. As for Sainsbury’s, they aren’t the first to treat their most loyal staff in such an appalling manner. Marks and Spencer’s followed the same path 2 years ago and we all know what’s happening to them now… Meanwhile, the complicated merger with ASDA has added an extra layer of confusion for staff who see their jobs as less secure than ever before. But Sainsbury’s has the chance to buck the trend. The consultation is halfway through, with the new contracts set to be signed by September. The pay rise on offer for the majority of their staff should be welcomed and encouraged. But this should not be to the detriment of others. They defend the changes on the lines of ‘fairness’, arguing that long-serving staff should see their contracts scaled down to match the poorer conditions on offer for new staff today. How about they level up terms & conditions, rather than down? That sounds fairer to me. 120,000 colleagues and customers have now signed a staff-led petition via change.org calling for a show of loyalty: https://www.change.org/p/support-sainsbury-s-shop-floor-staff-s-working-rights-we-re-not-in-the-money and I would encourage all readers to sign and share this petition using the hashtag #workwellforless. The staff consultation is approaching its latter stages and the voices of discontent are growing and amplifying. It’s not too late for Sainsbury’s to rectify their increasingly damaged brand. You can read more about this issue in the press: Press Association, Mirror, Independent, Guardian, Daily Mail, The Times, The Telegraph, City AM.